Eleven short days ago, the comics industry said a sad farewell to legendary artist Bernie Wrightson. 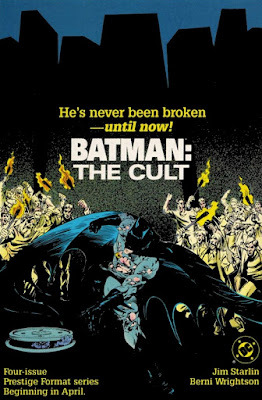 After reporting the news, my editors asked if I would be willing to write a piece reviewing Bernie’s largest – and most recognised – work featuring The World’s Greatest Detective; Batman: The Cult... who’s going to say no to that? It’s hard to believe that this title was originally released as a four issue mini-series way back in 1988, a whole 29 years ago! I was just 19 then, fresh faced and starting my first full-time job as a copy-writer and graphic designer for a small publishing company in London. Back then, monthly comics were still printed on the cheapest paper, with color was made up of tiny little dots. 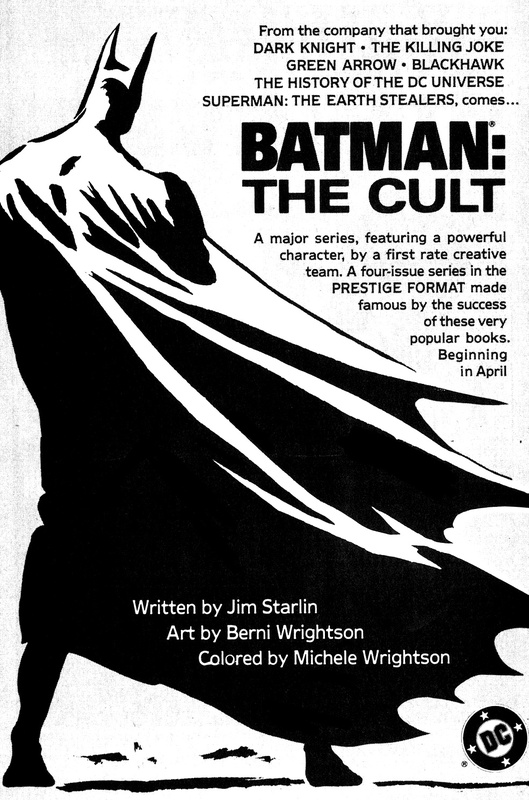 This was before Tim Burton’s Batman movie, which changed the public view of comics, and the Batman in particular. 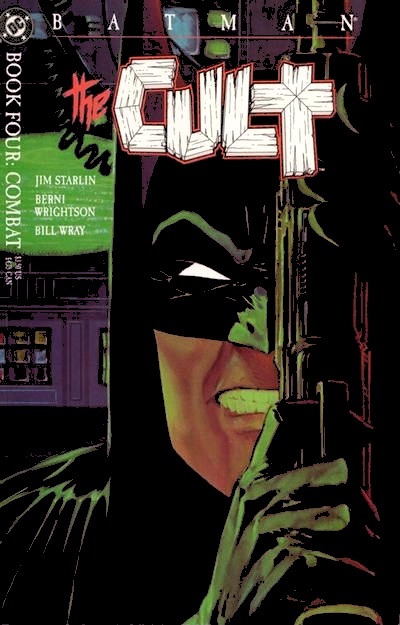 Batman: The Cult was one of the first DC books to be published in the new “Prestige Format,” due to the more graphic and less mainstream content contained in these stories. These books were printed on high quality glossy stock, with fully painted interior color artwork and lovely card covers. This made the titles more expensive, but also more desirable, collectable and durable. This book was truly one of the first comic-book “Events”. 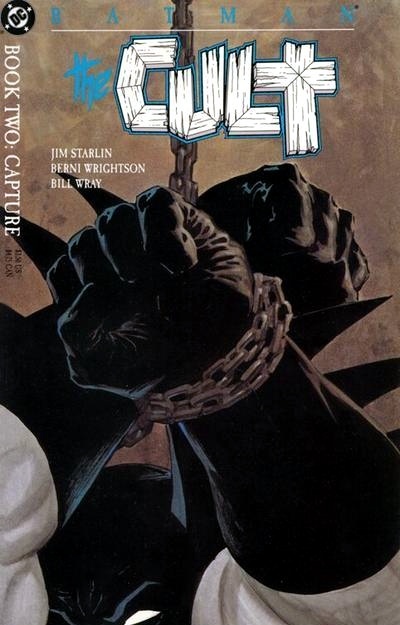 Where Dark Knight was a look into a possible future for Batman, The Cult was a story based in the now, it was real, it was happening today. 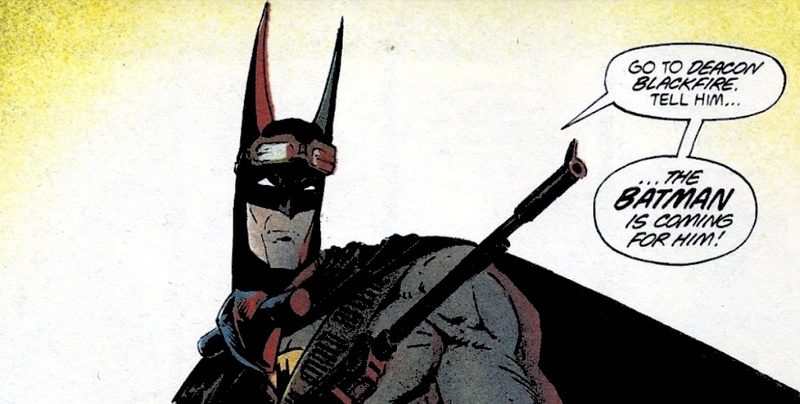 This was our Batman; beaten, bloodied, brainwashed and broken in current continuity. 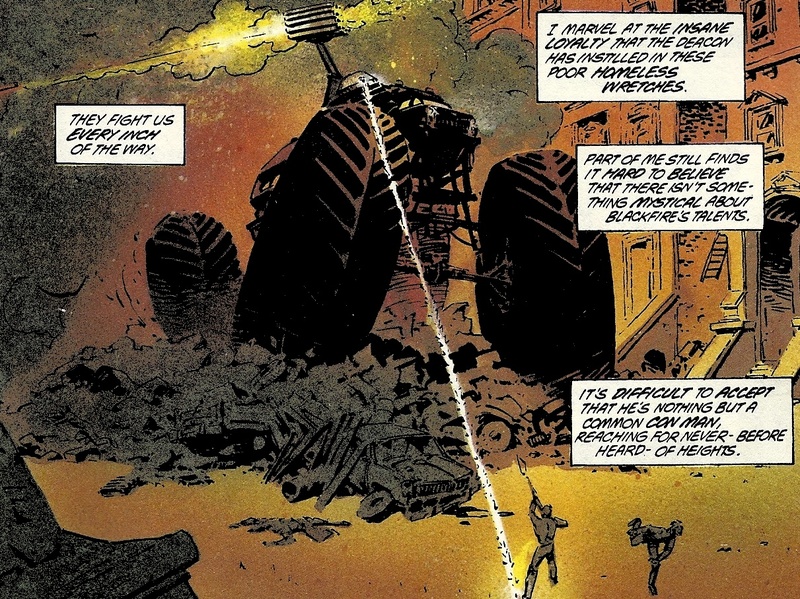 It was a part of the Batman mythos and history, not a what if or maybe. 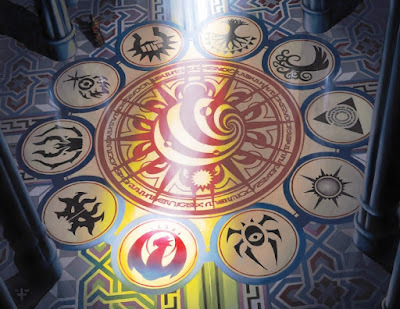 This tale also helped set the tone for much that has followed. In this tale, we see Batman so worn and weary that he doesn’t even know what’s real anymore. After going to the aid of a homeless person, who is seemingly being attacked by a gang of thugs, Batman is ambushed and captured. In the sewers beneath Gotham City, Deacon Joseph Blackfire has been raising an army of the homeless and disenfranchised to take over the city. 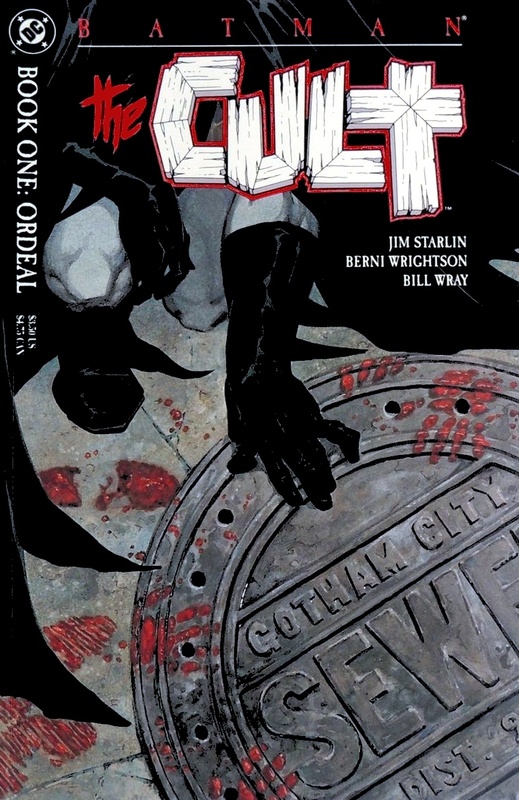 At first, the Deacon seems to be a good man, wanting to end homelessness and rid the city of crime, with Batman’s help. 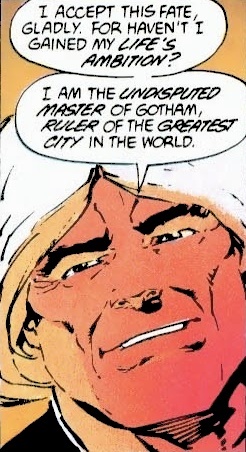 He drugs his victims and indoctrinates them into his cult, to further his real aim of running both Gotham’s organised crime and taking over from the city’s elected officials. Never before had we seen our hero starved, held captive, drugged, tortured and brainwashed. Batman was well and truly broken. 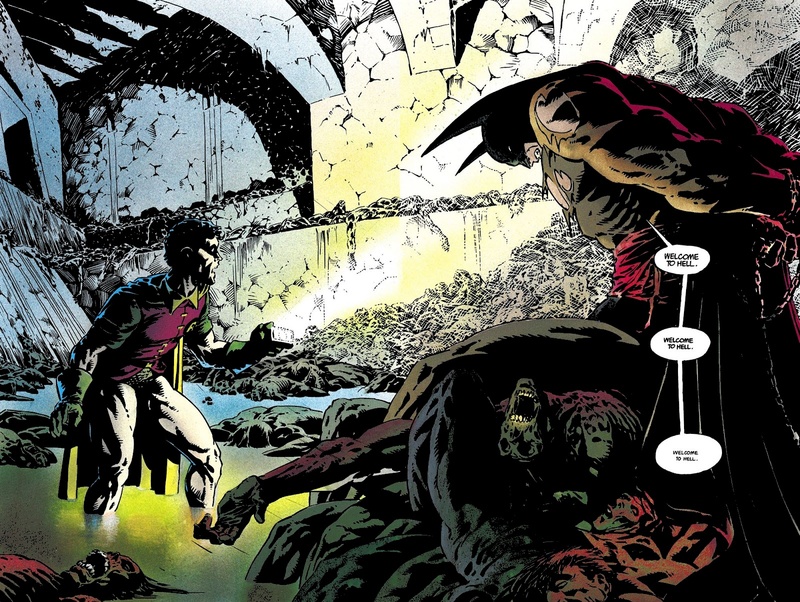 Jim Starlin and Bernie Wrightson had managed to do to Batman what no villain had achieved in over 35 years. Even after escaping from his captors, Batman is a shell of his former self. 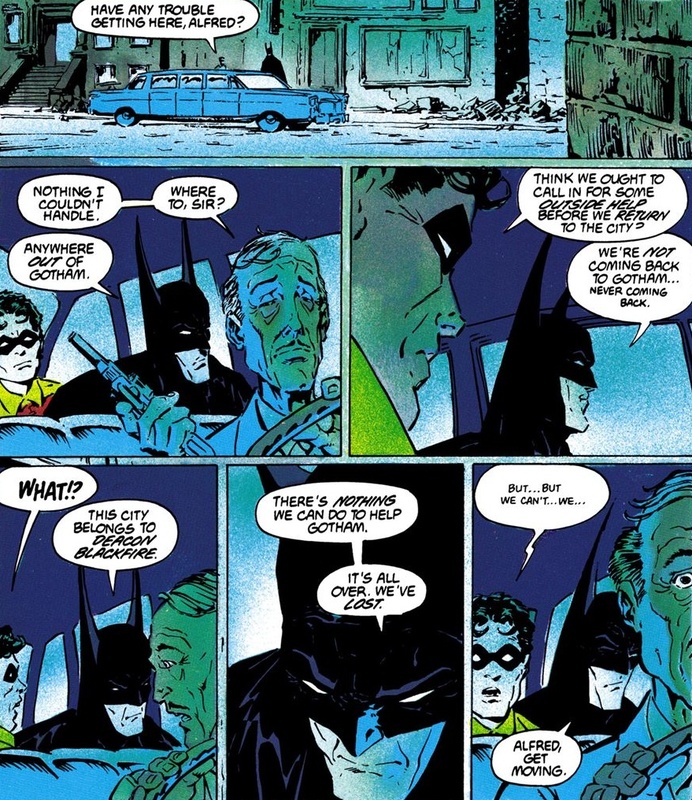 At one point, he even tells Alfred to drive away and not look back. Batman: Anywhere out of Gotham. Robin: Think we ought to call in for some outside help before we return to the city? Batman: We’re not coming back to Gotham… Never coming back. Batman: This city belongs to Deacon Blackfire. There’s nothing we can do to help Gotham. It’s all over. We’ve lost. 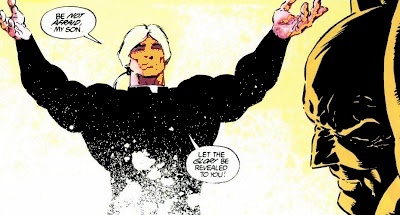 This exchange occurred at the end of issue 3. It left me feeling sick, scared and anxious. 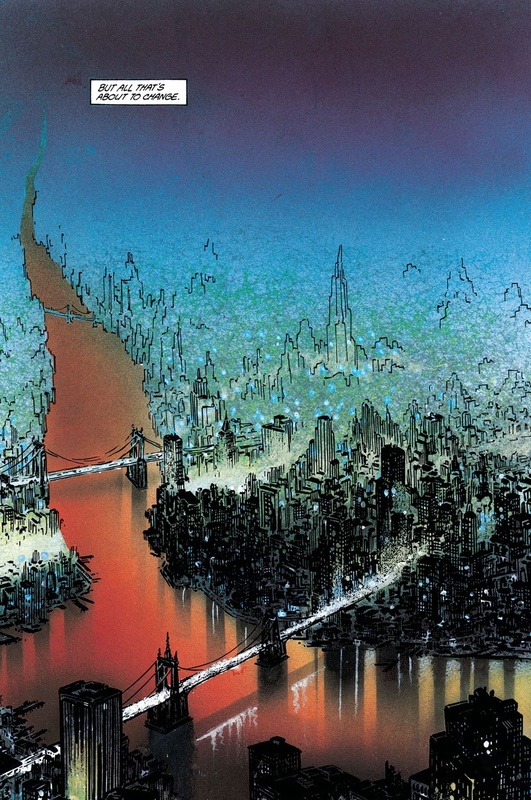 This was a comic-book and it had tapped emotions in me that had previously only been awakened by great art, music, movies or literature… Or real life and death. 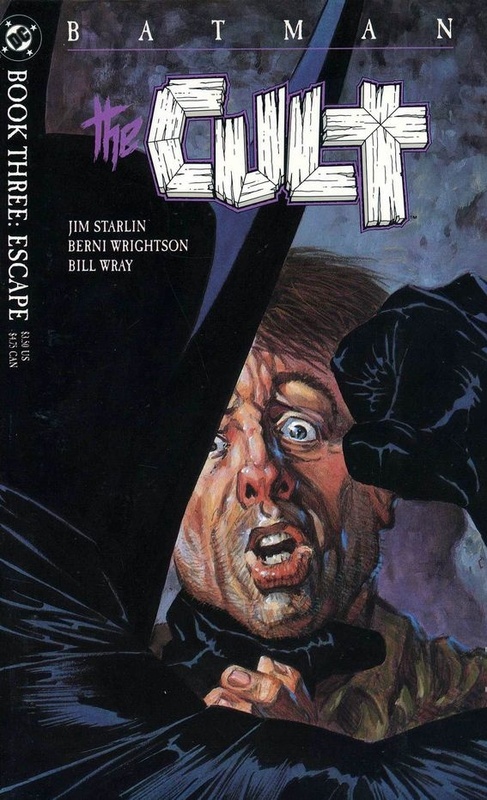 It was the worst kind of cliffhanger and I was worried that Batman was finished. Oh ye, of little faith! Bruce trains himself back into fighting shape. 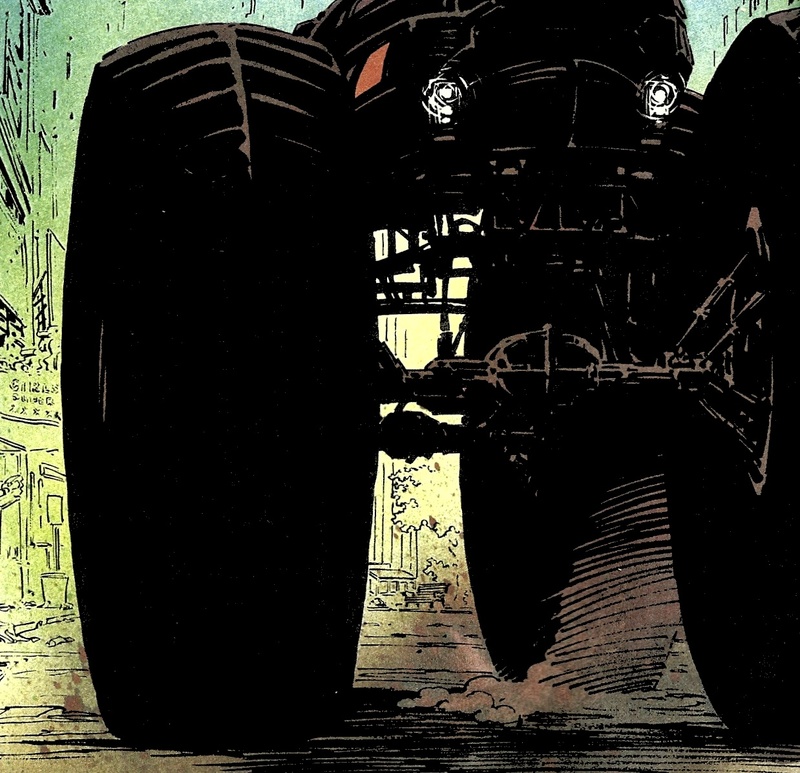 He and Robin get back into Gotham, using a severely souped-up Bat Monster-Truck and attempt to win back its war torn streets from Blackfire and his homeless army. Yes, I am a die-hard Bat-fan. I believe, that if he set his mind to it, there’s no obstacle that he can’t overcome and no adversary that he can’t defeat. 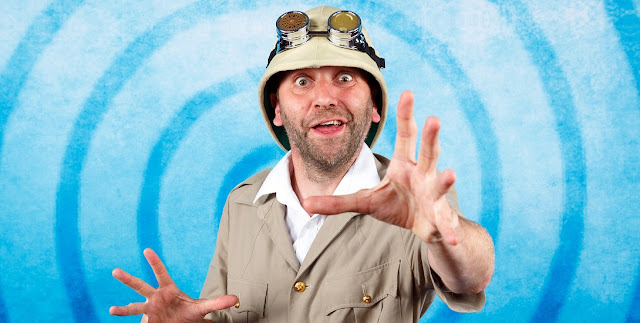 I don’t, however, subscribe to the notion that nothing and no-one could ever defeat him. That would be so boring! I don’t want to read about all powerful, unbeatable heroes. Being human may be seen as his weakness as a comic-book hero, but it’s also his greatest strength. The formula of an overwhelming defeat, a heroic struggle and a triumphant return has been used many times since The Cult: Venom, Knightfall, Bruce Wayne:Murderer/Fugitive, Batman: R.I.P. The Court Of Owls. 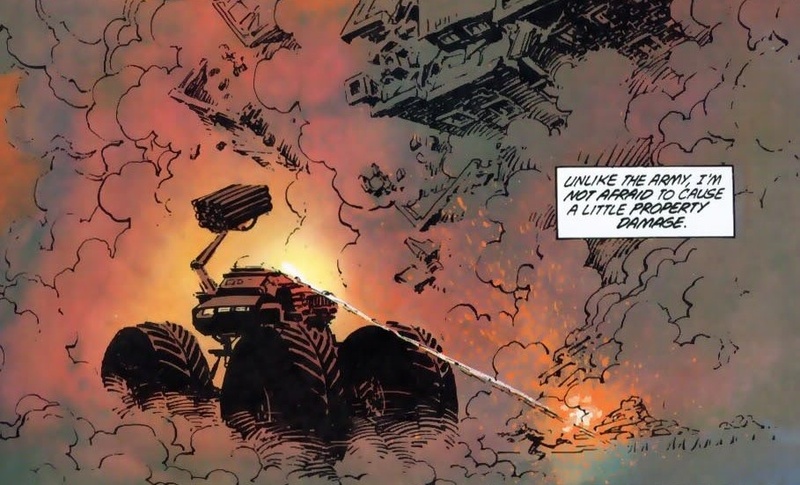 Even Christopher Nolan’s Dark Knight movie trilogy are an example of a story that follows, what I call, the Starlin/Wrightson Template. 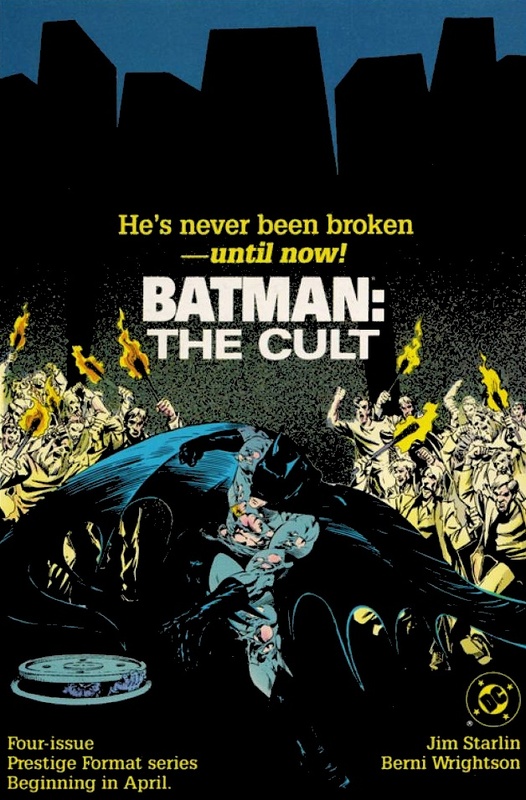 Batman: The Cult did it first. 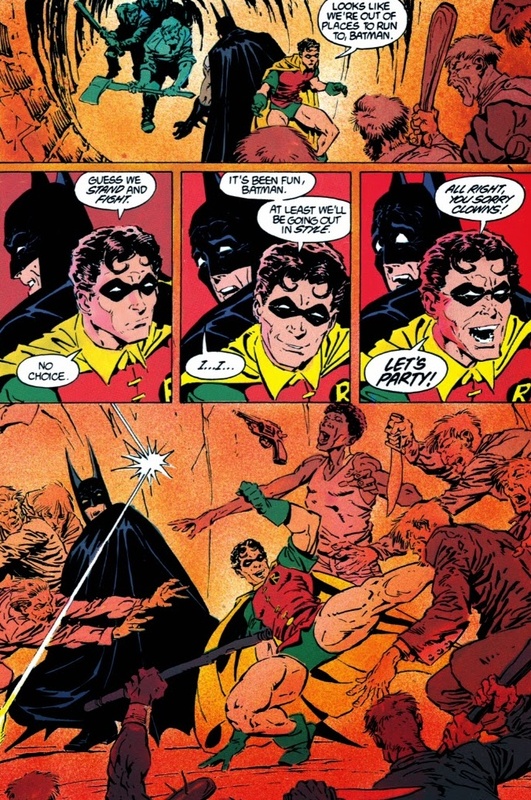 Jim Starlin gives us a sympathetic, believable Batman. A man driven beyond his limits and a hero ready to do whatever it takes. Bernie Wrightson draws a nightmarish world, full of psychedelic horror and all too realistic violence. 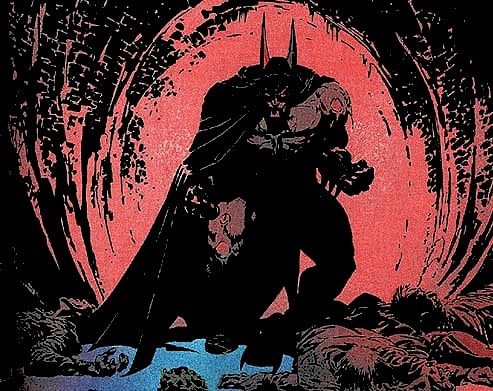 Wrightson’s Batman is truly a creature of shadows, a grim avenger of the night and a demon on the side of the angels. Deacon Blackfire is his polar opposite; a man of the cloth on the outside, but a dark demonic monster with the blackest of souls and the darkest of intentions at his heart. 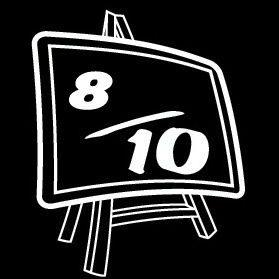 I think the story has aged very well, there’s a lot to admire and fans will be able to recognise it for the milestone that it is. It gives us a hero in crisis and his ultimate redemption. This story took me through a gamut of emotions; it scared me, it worried me and it astounded me. Seeing a man torn down, afraid of everything and at his lowest ebb is very humbling, especially when that man is usually so strong. Seeing a hero come back from defeat more resolute, more determined and stronger than ever is truly inspiring. Classic stuff. I always claimed I became the batman to fight crime. I did it to overcome the fear. If you haven’t read this story, please do. 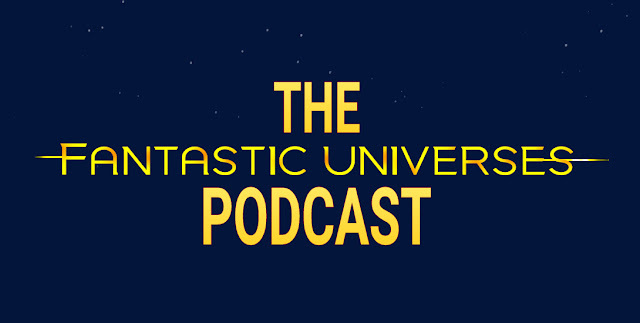 You will truly see how many great stories it has inspired. 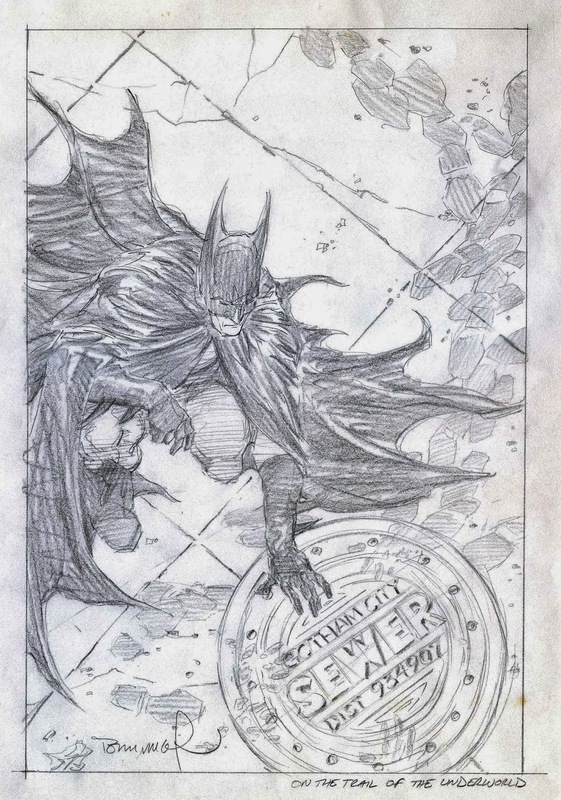 Plus, it’s the biggest collection of Bernie Wrightson Batman art ever collected. In my humble opinion, this alone makes this terrific volume worth the price of admission.